Each and every week, I, “So many books!” Henchman 21 and “Indeed!” Empress Eve read a lot of comics. Seriously you guys, a lot of comics. Maybe too many comics. I mean, it is possible… theoretically. Naturally, we look forward to some more than others. I mean, who doesn’t? 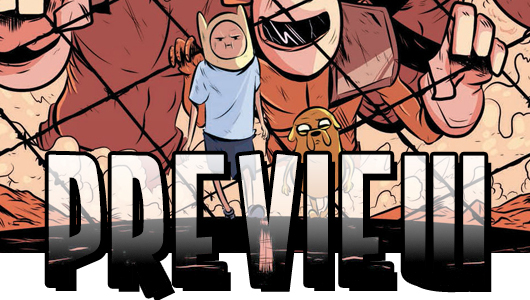 So, let’s take a look into the depths of our pull lists, grab some comics, and we’ll let YOU know what the top books to look forward to are for the week of October 1, 2014. Single issues and trades, they’re all here. Congratulations people, all of the comics are out this week. Every. Single. One of them. Okay, it’s not that bad, but there is an embarrassment of riches out this week, and if you want to buy all the good stuff, you may need a small loan. And I’m not going to be any help to you this week, because I am not about helping you trim down your comic buying list. Oh no, quite the opposite. I’m going to list a lot of cool stuff this week that is totally worth your time, so get ready. It’s rapid fire GoD List time! Each and every week, I, “Count Chocula” Henchman21, and “Boo Berry” Empress Eve read a lot of comics. Seriously you guys, a lot of comics. Maybe too many comics. I mean, it is possible… theoretically. Naturally, we look forward to some more than others. I mean, who doesn’t? 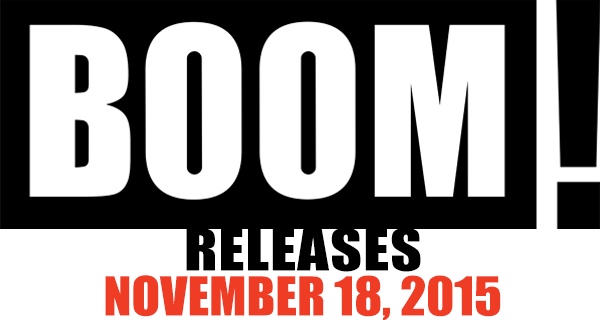 So, let’s take a look into the depths of our pull lists, grab some comics, and we’ll let YOU know what the top books to look forward to are for the week of October 30, 2013. Single issues and trades, they’re all here. It’s Halloween, kiddies which means it’s time for us to bring you a list full of creepy tales to keep you entertained on a dark and stormy night. Or maybe you’re not into the whole horror thing and you just want to keep up with your favorite superheroes. Fortunately, we’ve got something for everyone today. So go out and pick up some comics, and if you’re got a little extra money and plan on handing out candy to the neighborhood kids, consider buying some cheap kid friendly issues out of the quarter bins and hand those out along with the candy. It’s better than handing out floss or pennies or anything that isn’t candy. If there’s one thing we don’t recommend, it’s getting your house egged because you let down all those trick or treaters. So, go out, have fun, stay safe, and enjoy comics with this extra scary edition of The GoD List! 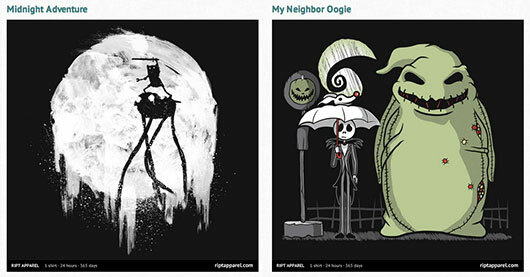 RIPT Apparel has two designs on sale today: the Adventure Time-inspired “Midnight Adventure” by Pandabacon (at left), and the The Nightmare Before Christmas mash-up with My Neighbor Totoro called “My Neighbor Oogie” by RatiganProductions (at right). The shirts went on sale at RIPT today, Thursday, October 10, 2013, at midnight CST, and will continue for 24 hours from then, and once it’s over, it will not be sold on the site anymore. Want to know what time it is!? It’s Blu-Ray watching time with Finn and Jake – two of the coolest heroes to ever hero-ize! 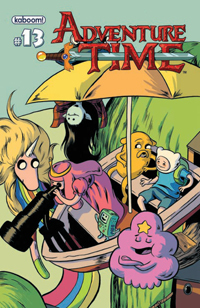 They’re traveling across the Land of Ooo searching for adventure, but adventure isn’t always easy. Sometimes you’ve got to battle mean little Fire Gnomes, Frozen Businessmen Zombies, and the very, very, very evil Ice King. What the Cabbage?! It sure is a lot of battling for just the first season. 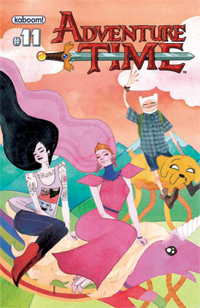 Created by Pendleton Ward, Adventure Time follows the adventures of Finn (voiced by Jeremy Shada), a human boy, and his best friend and adoptive brother Jake (voiced by John DiMaggio), a 28-year-old dog with magical powers. A couple of weeks ago it was announced that BOOM! Studios would be releasing a comic book series based on Cartoon Network’s Regular Show through their KaBOOM! Studios imprint. Well, now we can say who will be working on the comic when it comes out in April. The series will be written by K.C. Green (who writes and draws the webcomic Gunshow) and will feature art by Allison Strejlau. 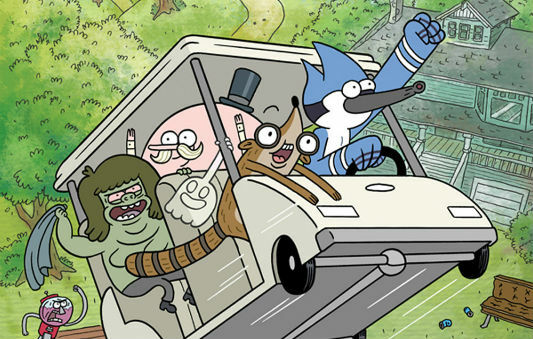 Regular Show follows Mordecai and Rigby on their daily adventures working in a city park.